Let’s hear it for torture! The US Justice Department just released a 370 page report detailing US torture in Iraq, Afghanistan and Guantanamo. Many FBI operatives were so appalled at what they observed that they blew the whistle. It’s all in the Report readily available on the Net. This torture was blessed at the highest levels by GW Bush and Condoleeza Rice who apparently wanted to prove that she could take her place with Margaret Thatcher,Hilary “Eradicate Iran” Clinton and Golda Meir in the pantheon of female leaders who had few real feminist values. Rice, arguably the worst national security advisor in modern history was given an honorary degree by the Jesuit-run Boston College. One of the Church’s fundamental moral principles is the absolute dignity of the human person. This principle is absolutely traduced by torture. What ever got into Jesuit president Bill Leahy’s head is beyond the ken of most serious observers. many theologians at BS were appalled and said so in a letter to the Boston Globe. “On the levels of both moral principle and practical moral judgment, Secretary Rice’s approach to international affairs is in fundamental conflict with Boston College’s commitment to the values of the Catholic and Jesuit traditions and is inconsistent with the humanistic values that inspire the university’s work,” the letter said. It pointed out Pope John Paul II’s opposition to the war in Iraq. ”I have no objection to her coming here to speak — I am in favor of free speech — but I don’t believe we should be honoring her with an honorary degree,” theologian David Hollenbach said. Now that this sad report has condemned the Christian leadership in the US government of blessing torture, will the US Catholic Church comment on this? Will Catholics in the USA wake up to just who they voted for? By the end of 2005 the entire oil sands industry’s daily consumption of natural gas could heat 3.2 million Canadian homes for a day according to Alberta’s Pembina Institute. To create one barrel of oil Syncrude Canada Ltd uses enough natural gas to heat an average home for 4 days in winter. Wells are being poisoned and aquifers polluted as the Calgary centred and dominated government seems deaf and dumb to the land and those who farm it. Strange cancers are appearing in the Native community. This government is absolutely disconnected from the earth as a living organism. Canadians woke up to this fact when a few years ago Wiebo Ludwig, an evangelical farmer launched a bombing campaign to drive oil companies off his land. Ludwig was convinced with much evidence to support him that these sour gas wells were harming his family and community. 28 months in jail was his reward. Stephen Harper’s response was to gut the Kyoto protocol and exempt the entire oil sands industry from making any emissions reduction until 2010. By 2020 (yes, 2020) it promised a reduction of greenhouse gases of 20% based on 2006 levels. The only problem is that climate change experts say only an 80% reduction will head off catastrophe. Stupid to the last drop as Wayne Marsden calls it. The Calgary Catholic school board’s consideration of putting Support our Troops decals on its vehicles is foolish in the extreme. First most Canadians do not support the war in Afghanistan so it would simply raise a red flag and divide Canadians and Catholics of all stripes. And let’s get rid of the canard that we want to support our troops. Of course no one in their right mind wants harm to come to anybody so we support our troops. Like we support the thousands of innocent Afghanis and hundreds of thousands of iraqis who have been victims of GW Bush’s war which the Vatican called” illegal, unjust and immoral.” All are made in the image of God. These dead Afghanis and Iraqis are no less children of God than our Canadian troops are. There is but one human family. Catholic schools are caught in a conundrum: which drum do they march to, Caesar’s or Jesus, the nonviolent lord of Love? If we follow Jesus we will be totally out of synch with government policies in the area of war and peace. The Canadian Army under Rick Hillier has virtually destroyed our international reputation of peacekeeping. The idealistic Canadian Catholic young men like several of their US counterparts should give serious consideration to leaving this brand of new militarism. Their faith is in jeopardy. Being a junior partner in the American empire is not only a repudiation of our hard won international reputation but for Catholics it should produce a serious crisis of conscience. Here trustee Wellman is mistaken. We need to remain as neutral as Jesus was—the reason our schools exist is to reflect those countercultural values, one of which is surely the value of peacemaking. The Beatitudes of justice, peace and mercy got Jesus murdered. This is not mere neutrality. The nonviolent Jesus ( an absolute consensus of New Testament scholars) has been sadly traduced since the pagan Constantine (311 CE) used Christianity as an extension of empire.This has been going on for 1700 years now. It is time to stop. Vatican ll (1965) invited Catholics to undertake an evaluation war with an entirely new attitude” since modern war eventuates in a ratio of 90/10 civilian casualties. The Just War theory propose by Augustine (c 400 C.E.) derived not from Jesus but from the Roman Cicero. Growing scriptural scholarship is rapidly proceeding to an absolute rejection of war and war preparation. Under Pope John Paul ll the Church has all but rejected capital punishment. War must be next. Picking up the cross of Jesus simply means laying down the sword. It also means rejecting the insane 50 billion dollar Harper budget for feeding this omnivorous militarist maw. As Lyndon Johnson learned-you cannot have guns and butter. I believe it is time that the Catholic trustees collectively go on retreat and reflect deeply on the values of Jesus. The tribal god is dead.It is time to embrace the nonviolent God.we need to move beyond out nonhuman past and break the cycle of of the violent theism which has deformed our faith. Catholic schools and boards would be a good place to start. 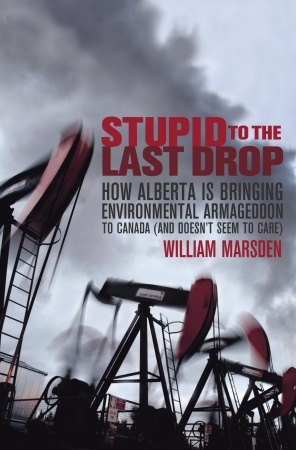 William Marsden in his investigative report notes that Alberta a province whose population could fit inside of Toronto but which seems to be inspired by Dallas, Texas, in 1988 produced 22% of the CO2 emissions in Canada.They were then as now the highest emissions in the country.The Energy Efficiency Branch(EEB) of the Alberta government produced a report acknowledging greenhouse gases as a threat to life on earth. It then outlined a strategy to cut these emissions by 20% by 2005. This would put these levels below what Kyoto demanded. The report was filed and deep sixed by the noted Minister of the Environment, Ralph Klein. Yes, Minister of the Environment, like in foxes to guard the henhouse. When he became Premier the great Canadian gutted and slashed the environmental budget the EEB and campaigned against Kyoto. His government and the Reform Party then created Friends of Science to campaign vs Kyoto. Barry Cooper, a prof at U of Calgary, a confidant of P.M. Stephen Harper (“Kyoto is driven by the socialists”) set up a fund at the University to funnel anonymous donations to the “Friends.” Great Canadians, all. Read the book—it’s a gasser. It is of course preposterous that a middle power like Canada should be spending this amount of money on phantom invaders like the Norse, the Laplanders and some Eskimo terrorists. But Conservatives are notorious on playing the security card in a post 9/11 world. They have never grasped the idea that security will only come after basic needs around the globe are met. Canada as a military force today is an oxymoron, a betrayal of our most cherished peacekeeping values. The churches we hope ill be outraged at this spending—more money for guns and less for butter as the saying goes. More money for needless military and less for decaying infrastructure, true foreign aid and education becoming more expensive week by week. Misplaced priorities. soon Canada wil be like the USA—the poor forced to join the military to get an education. Budgets and government expenditures are moral documents and this fails the smell test. To paraphrase Martin Luther KIng Jr , a nation which spends money on death and security is headed for spiritual suicide. So writes a blogger on Hilary the Rambo who struggles to prove a woman can have cojones in foreign policy. Far from being the stereotypical feminist-pacifist of your imagination, the woman to get closest to the Oval Office has promised to “obliterate” the toddlers of Tehran — along, of course, with the bomb-builders and Hezbollah supporters. Earlier on, Clinton foreswore even talking to presumptive bad guys, although women are supposed to be the talk addicts of the species. Watch out — was her distinctly unladylike message to Hugo Chavez, Kim Jong-Il, and the rest of them — or I’ll rip you a new one. Meanwhile Jeffrey St. Clair in a special Counterpunch report details the absolute corruption of the power couple, He describes in great detail the sickening pardon of billlionaire crook Mark Rich on Clinton’s last day in office. It makes for depressing reading, not for the faint of heart, those who still believe the Clintons are not bought and paid for. The way to Bill was through Hilary. In the long line of valiant women like Susan B Anthony, Elizabeth Cady stanton, the Pankhursts, Hilary Clinton does not merit a foortnote. If feminism is about doing politics in a new way, Hilary Clinton either needs to regroup, rethink or simply disappear from the national stage. Imagine the hysterical response if Iran had made such a statement. In the US election Barack Obama is the Feminist candidate arguing the issues in a fairly dispassionate way, preferring reason, consensus and the common good over power relations. Clinton on the contrary has become so desperate that she will say anything and do anything to keep the Oval Office which her husband besmirched and pimped while he was there (The Lincoln bedroom) and then has so shamelessly abused as a cash cow in his retirement. This power couple breathe entitlement. Even Richard Nixon and Harry Truman refused to take a dime as ex-presidents believing correctly that they were rewarded enough with a generous pension and the satisfaction of having achieved the pinnacle in serving their country. The Clintons have become an embarrassment. One hopes Americans will vote for the feminist candidate. Whether Barack wins or loses (and I dearly hope he wins for America’s sake) his candidacy has certainly brought race to the forefront in the USA. In the wide and diverse black community, there is some anger. Bob Herbert (who is black) the distinguished NY Times columnist, flayed Wright in a column for doing damage to the one black who can ameliorate the conditions of poor blacks. I wish that he would have become more “monk like” and let sleeping dogs lie. No doubt this is a sad spectacle particularly in the fraying of relationships. In the end it simply has proven to me the truth of the well known adage, that Sunday morning is still the most segregated hour in America. Whites if they did ever attend a black church might be shocked at the liberation theology they heard there. But then it surely is a matter of social location and too many whites enmeshed in their long privileged position are simply unable to hear the prophetic word from the underside of history. The faux religion experienced in segregated enclaves has often been a religion of power and exclusivity blessing a racist status quo. That they are still shocked at Wright’s truth telling about America could be a wake up call. Some will learn from this and heed the message. Others will stick their heads in the sand and allow the latent racism to define themselves. And they will shout, Mc Cain for Presdent.8 more years! 8 more years! Larry King had a full hour with Michael Moore last night and once again it revealed a man for all his flaws who comes close to being a secular, tier 2 level, prophet and one who has deeply internalized the sacramental nature of the Catholic imagination. First, Moore will be remembered along with another Catholic,Phil Donohue as one of the rare figures in the USA who disturbed the national consensus of post 9/11 America.With his books and movies like Bowling at Columbine and Fahrenheit 9/11 Moore almost alone did the brave work which the media failed to do-challenge the deceit and lies of the Bush administration. Moore took the venom of of a somnolent America on his broad shoulders as his native land sleep walked toward an “immoral, illegal and unjust war” as the Vatican termed the Iraq catastrophe. The New York Times and Washington Post later apologized for their extraordinary dereliction of duty as members of the Fourth Estate. Hilary Clintin ad John Kerry voted for the war. And as Moore said last night,”would you want as president somebody (Clinton) who failed to grasp what 30 million Americans understood”-that GW BUsh had already made his mind up and was simply cobbling a farrago of lies to justify his pathetic desire to be seen as a wartime President.” Mission accomplished. As for Moore’s impressive Catholicism,consider this. In answering Larry King’s query about Obama’s former pastor Jeremiah Wright, Michael Moore said this: “I have no right as a white man to answer that question.Can you imagine what wright has experienced in his life as a black man in America? and what balcks are still going through? sure he said some things which may outrage us but put it into context of his life and what he has seen.” Contrast this with Hilary’s fake high dudgeon that she would have walked out of the church. Moore’s answer was brilliant and indicated to me that he had successfully grasped the Catholic imagination, the ability to walk in the victim’s shoes and refuse, like the Jesus of John 8 (the woman caught in adultery), to condemn Wright. No cheap political posturing, simply compassion and a deep understanding vouchsafed to precious few whites, of the extraordinary suffering of the black community in America. Moore’s life, fired by his prophetic Catholicism, has been and continues to be one which has been marked by a deep solidarity with the black community. In this sense I believe Moore to be more black than Condoleeza Rice.